We validate emails using RFC 2822 and RFC 3696. 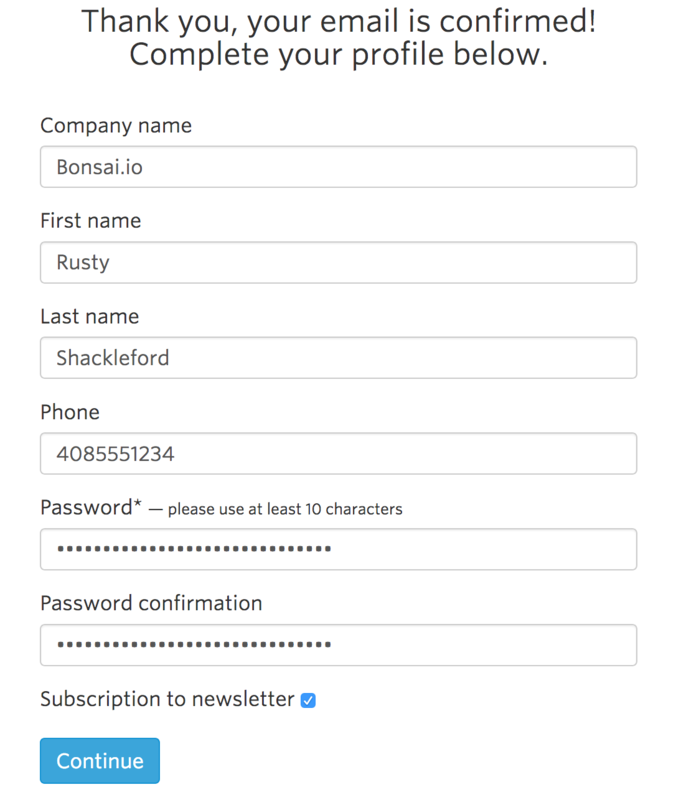 If you have a non-conforming email address, let us know at support@bonsai.io. If everything is good, you should receive an email from us shortly with a confirmation link. Click on the button, which will take you to a form to complete your sign up. 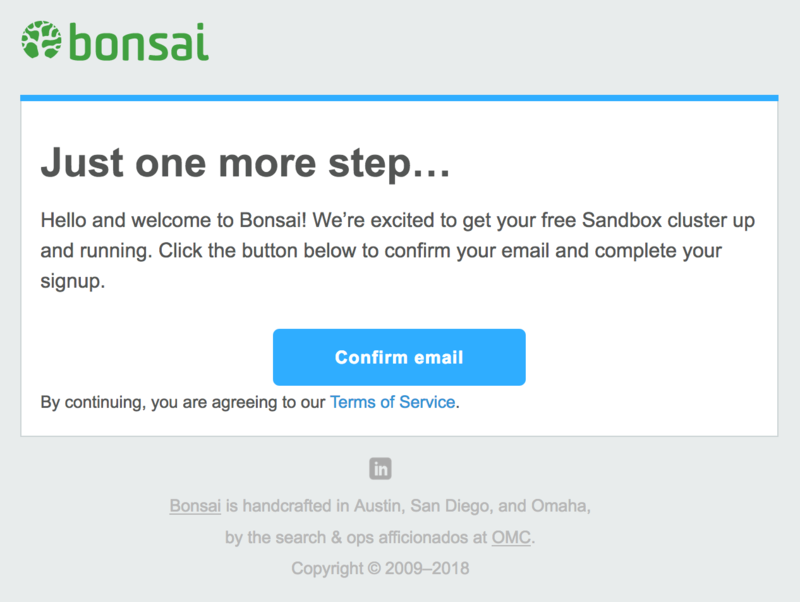 If you have signed up for Bonsai in the past using this email address, you will receive an email directing you to log in using it. 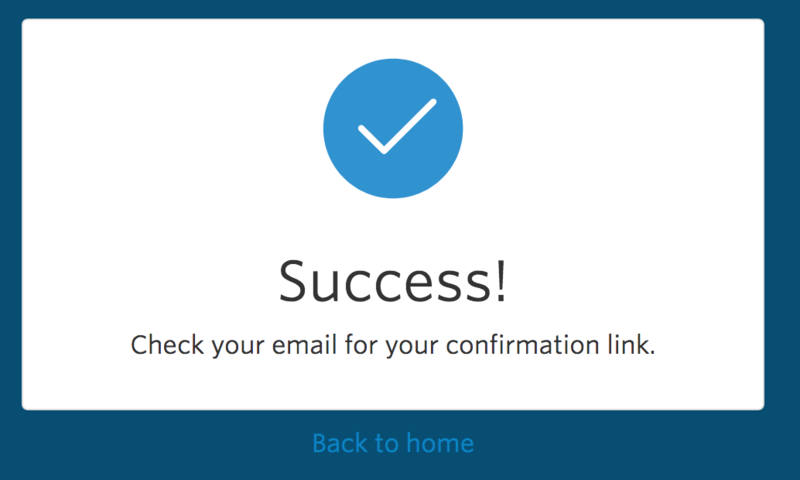 After clicking on the Confirm email button from the confirmation email, you will be presented with a simple form to complete your account. We’re a security-conscious bunch, but we don’t have any arcane rules about what kinds of characters you must use for your password. Why? We’ll let xkcd explain it, but the tl;dr is our password policy simply enforces a minimum length of 10 characters. We also reject common passwords that have been pwned. Sadly, correct horse battery staple appears in our blacklist. We also highly recommend using a password manager like 1Password to generate unique, secure passwords. 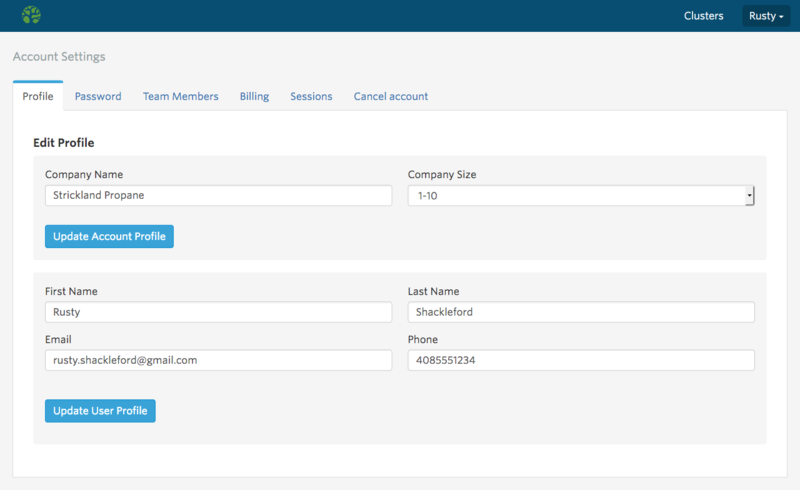 Once your account has been created, you’ll be able to create your first cluster. 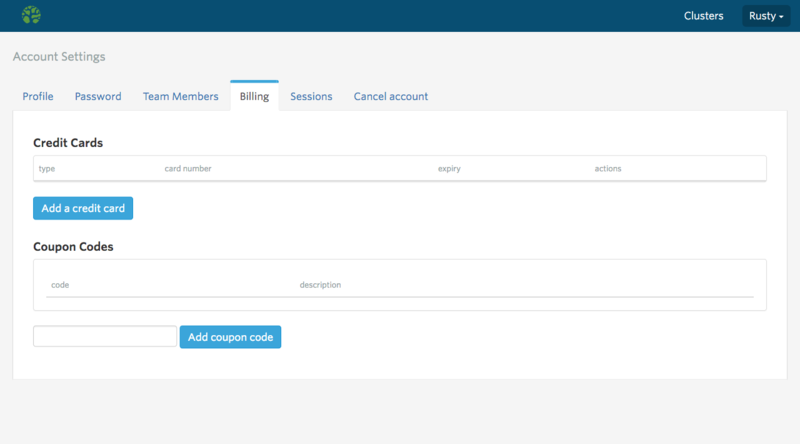 You can provision a free starter cluster without entering payment details. If you wish to provision or upgrade to a larger cluster with more resources, you’ll need to add a credit card (see below). 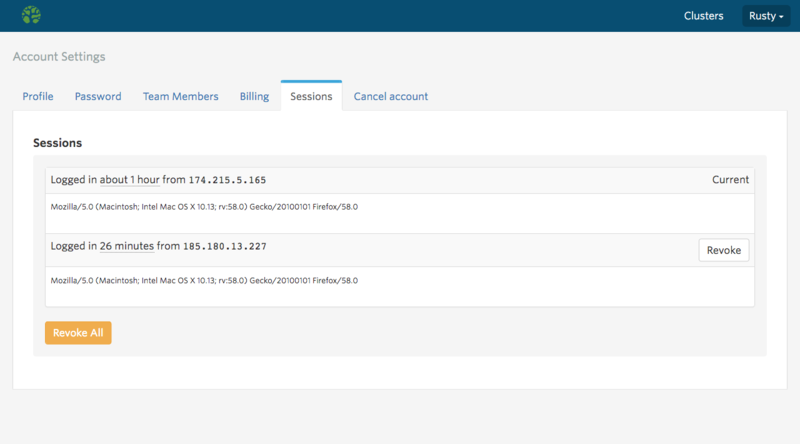 The dashboard lets you customize your cluster a bit before it’s provisioned. As you make changes, the summary on the right hand side of the screen will update. There are several attributes that can be configured, which are discussed in detail below. 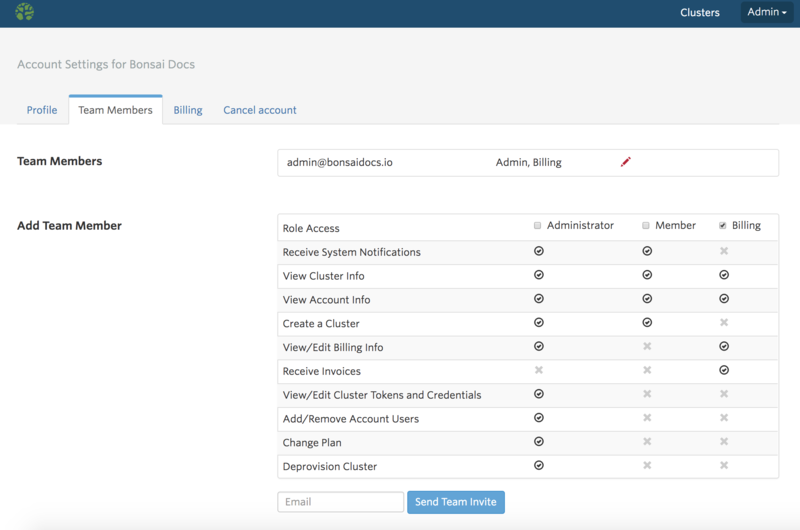 Users are able to manage multiple clusters through their Bonsai dashboard. Not only is the cluster name a label for you to distinguish between different applications and environments, but it’s also used as part of the cluster’s unique hostname. For example, if you name your cluster “Erin’s Exciting Elasticsearch Experiment,” that will be the name of your cluster. The host name of your cluster URL will be automatically generated into something like erins-exciting-elasticsea-123456. Cluster names can be changed later, but the host name that is generated when the cluster is first created is immutable. These regions are supported due to broad demand. We can support other regions as well, but pricing will vary. Shoot us an email if you’d like to learn more about getting Bonsai running in a region not listed above. Also note that you will want to select a region that’s as close to where your application is hosted as possible to minimize latency. Doing so will ensure the fastest search and best user experience for your application. We support a number of Elasticsearch versions in different regions, however not all regions will support all versions. The available options will appear in this dashboard, and if a version is not available in the region you have selected, it will be grayed out. We can accommodate specific versions of Elasticsearch on Enterprise deployments. If you need Bonsai to run a version of Elasticsearch in a particular region not available on the Create a Cluster dashboard, email us to discuss options. 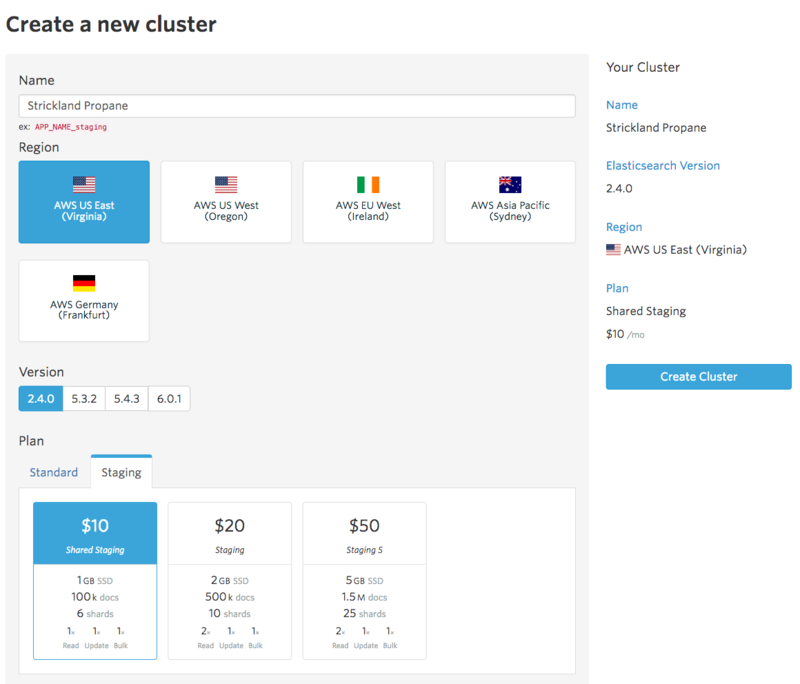 You can upgrade your plan at any time, and your cluster will scale automatically. In some cases, such as upgrading to a single tenant or Enterprise grade plan, we will need to schedule a data migration, which may require a few minutes of read-only mode. If this is a possibility, we will work out the details with you beforehand. 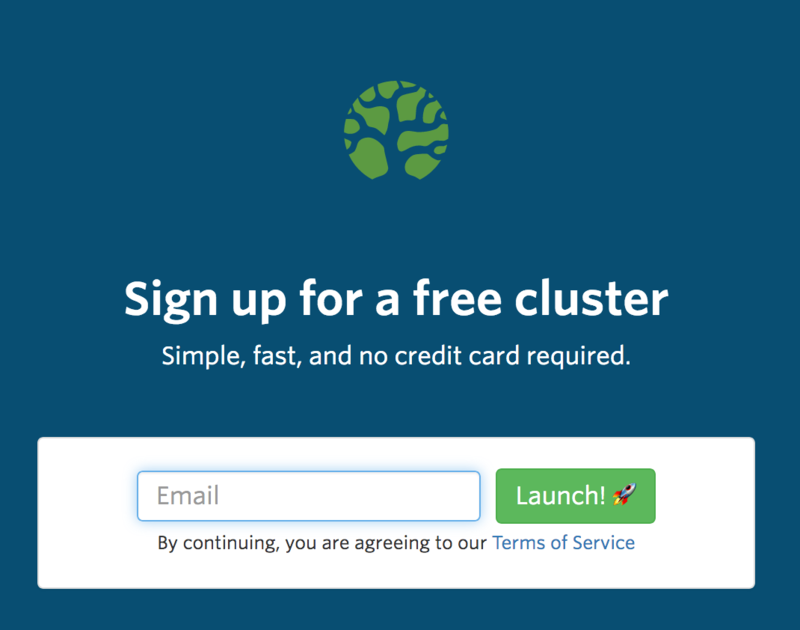 No credit card is required to spin up a free cluster on Bonsai. Free clusters are designed for small apps with minimal usage, and their limits reflect this. If you decide that you’d like to scale up to something a little beefier, you’ll need to supply a credit card. While the first cluster can be free, customers are limited to a single free cluster for each production-grade (paid) cluster. Congratulations! Your Elasticsearch cluster will instantly be up and running, and you will be automatically routed to your cluster dashboard. At a glance, you will see the cluster, the region in which it’s located, the plan that it has, and some indicators about usage. Initially, these indicators will be empty because you haven’t used the cluster yet. Bonsai clusters are configured to support HTTPS and HTTP Basic Auth out of the box for security. The URL contains a randomly-generated username and password combination that must be included in all requests to the cluster in order for Elasticsearch to process a request. If you’re seeing this message, then you’re not including the correct authentication credentials in your request. Double check that the request includes the credentials shown in your dashboard and try again. If your URL is leaked somehow, you can regenerate the credentials. See Exploring Your Cluster Dashboard for more information. Now that you have created your cluster and verified that it is up and running, you can take a look at your cluster in greater detail. Need to change your email, password, update a credit card, or provide access to your clusters to a coworker? Use the sections below to manage all things account-related. To access your Account Settings, click on the upper right-hand dropdown and select Account Settings. You can change your login password here. You will need your current password in order to create a new password. Bonsai accounts support multiple team members, each with specialized roles. Account owners can invite new users to join the organization. 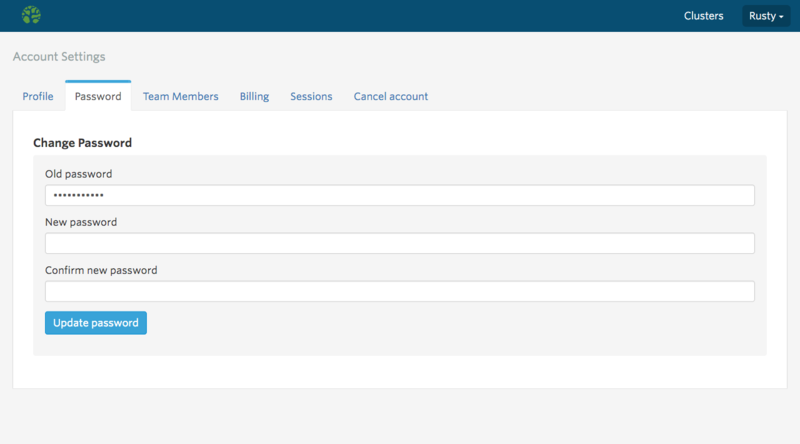 At least one Billing and one Admin role are needed for each account, so the first user in the account defaults to having both the Admin and Billing role. After sending the invite, you will see the invitee listed along with their roles. You can also remove a team member from your organization by clicking on the Remove button. You will not be able to remove the last Admin or last Billing member on the account, as at least one of those roles is needed. If there was a mistake, or a role needs to change, you can click on the pencil icon to edit the user’s role. This will allow you to update their role(s), which will take effect immediately. If you haven’t added a credit card yet, or would like to update your payment profile, you can do so under the Billing tab. Fill the details out and click Save to proceed. When you add a credit card in Bonsai, the information is encrypted and passed to our payment processor. We have verified that this service is Level 1 PCI Compliant. This level of compliance is the highest level of security a business can offer. We do not host or store any financial data, and your credit card details can not be accessed by anyone on our team or within the payment processor. To update an existing card, for example, if you have a new expiration date, simply click on “Add a credit card,” and enter the new details. Save it, then set it to be the new default. Then you can delete the older card. 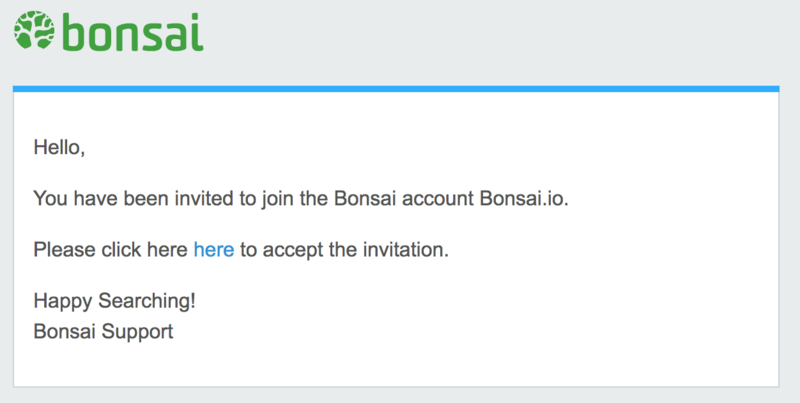 If you have a code that isn’t working but should, shoot us an email at support@bonsai.io and we’ll check it out. This screen shows all the locations where your account is logged in. If you would like to revoke access to a session, simply click on the “Revoke” button next to the desired section. This will force the browser at that location to require a new login. The Current session is the one you’re using to view this screen. It can’t be revoked, but you can log out, which will accomplish the same thing. We’re sorry that you no longer want to have an account with us, but wish you the very best with your application and search. If there’s anything you feel we could do better, please don’t hesitate to send us an email with comments.